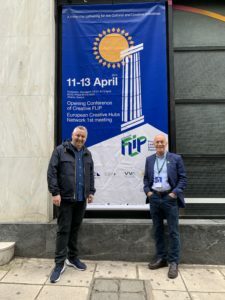 David participated in the European Creative Hubs Network (ECHN) events in Athens in April 2019. As an international creative industries specialist, David often works with creative hubs to help them and their creative enterprises to become even more successful. 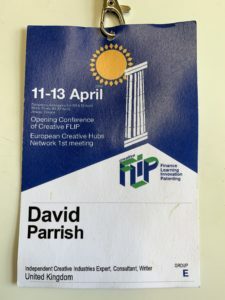 Because of his work with creative hubs in Europe and beyond, David was invited to participate in the events in Athens. 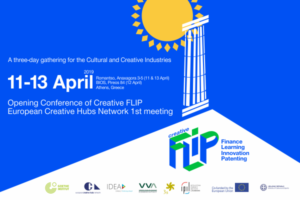 In Athens, the European Creative Hubs Network launched a new project: Creative FLIP (Finance, Learning, Innovation, Patenting in Cultural and Creative Industries). This is a pilot EU funded project for Cultural and Creative Industries, led by Goethe Institute in partnership with IDEA Strategische Economische Consulting ,VVA Brussels Sprl ,3s Unternehmensberatung GmbH (3s),Institut de la Propriété Intellectuelle Luxembourg G.I.E and European Creative Network (ECHN). 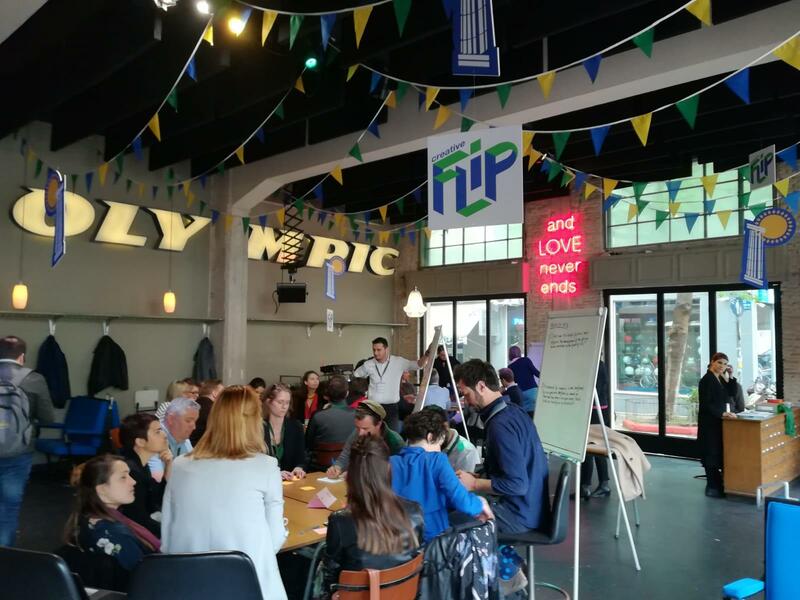 The project launch coincided with the European Creative Hubs Network 1st meeting. Mark Lawler from Baltic Creative CIC in Liverpool, UK. Jennifer Buxton from Nova Ivica in Montenegro. Sarah Daly from Creative Spark in Ireland. Marina Batinic from Culture Hub Croatia. Selin Erden from Hamam Arts Hub in Turkey. Lorène Garcia from MOB Barcelona in Spain. Kai Huotari from Kaapeli in Finland. Ben Kolp from The Living Room in Malaga, Spain. Alessandra Tempesti from Lotto Zero in Italy. Pieter Aarts from the Design Management Netwerk in the Netherlands. Tania Brugnoni from 1535° Creative Hub in Luxembourg. Joana Carvalho from DINAMO10 in Portugal. Ellada Delianidi from HONOID in Georgia. James Howie from ASCUS in Scotland. Esra Gonen from ORIGINN in Turkey. Konstantina Karameri from Culturepolis in Greece. David also met with representatives of the British Council, one of the partners in the European Creative Hubs Network. 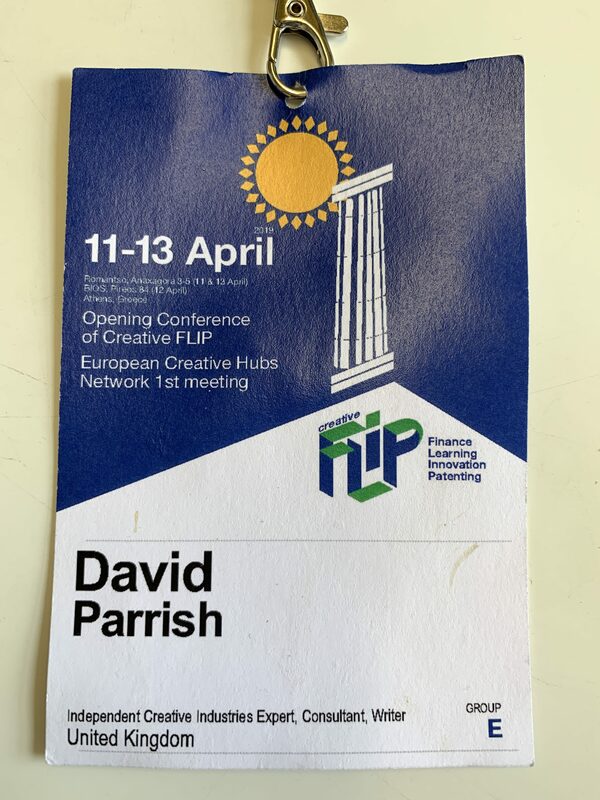 David has worked with the British Council on a number of projects throughout the world connected to the Creative Economy, the Creative Industries, creative entrepreneurship and associated initiatives as a conference speaker, trainer and specialist cultural economy business adviser. The British Council has also assisted in various ways to make David’s book ‘T-Shirts and Suits: A Guide to the Business of Creativity’ available in translations in 13 countries around the world. David works in partnership with Creative Hubs world-wide, to help them make their creative enterprises even more successful. He has delivered creative business development workshops and business growth presentations at creative hubs, accelerators, co-working spaces and creative business centers in Thailand, Slovenia, Bulgaria, Bosnia & Herzegovina, Vietnam, Estonia, Kazakhstan, Spain, Malaysia, Indonesia, Colombia, Kosovo, New Zealand, Ireland, Belarus, Ukraine and the United Kingdom. David has helped creative industries enterprises in more that 50 countries around the world by working in partnership with creative hubs, accelerators, co-working spaces and creative business centers, conference organisers and creative industries support organisations. David works internationally helping arts organisations, cultural enterprises and creative businesses, who are often located in Creative Hubs. As well as facilitating strategic planning events for board-level management teams in hubs and other organisations, he provides management consultancy and business advice to chief executive officers, directors and owners of businesses and cultural enterprises.